Who do you think are your company's best sales reps and marketers? If you answer anything besides existing customers, you are wrong! The existence of your business to convert potentials into clients depends on your recurring customers. But we have bad news for you. Customers’ trust in businesses is eroding! According to HubSpot Research, personal recommendations from friends and family are the go-to opinions for most customers. However, in their absence, says BrightLocal, online reviews will do in a pinch for about 85% of consumers! Besides this, HubSpot Research reports that 60% of consumers attach enough importance and trust to customer reviews that it leads to a purchase decision. What does this mean for your business? It means that if your company website is sporting a good number of positive reviews, you might be unknowingly converting customers! You should use a good reputation management tool to generate positive reviews and attract more customers. The surest way that your sales and customer service employees solicit reviews from customers is to make it a part of your work process. This would help them understand how important the review system is to the company. Implement an incentive program and reward employees with a cash bonus for a certain number of reviews. For example, they get $100 for every 3 reviews and so on. The bonus shouldn’t necessarily be cash. If you are a small business that can’t afford to hand out money, think about something else that is equally effective. Whenever a client does business with you, send them a friendly follow up. You can email them for their feedback after any kind of interaction. It isn’t just the post-sale period that is rich with feedback opportunities. The pre-sale process can also help improve the sales that will come in the future. If you want to gather all your customer feedback in one place, you can use an all-in-one platform for that. This will help you streamline the content and make it easier for you when reviewing/responding to it. Some examples are platforms, such as Whitespark’s Reputation Builder. These offer other benefits also like capturing your Net Promoter Score NPS. The NPS is a customer-experience centric metric. It asks a customer how likely it is that they would recommend a brand/product/service to a relative. Depending on the number of customers who rate higher than 8 – or below 6 – a business can determine how many promoters and detractors they have. Place yourself in your customers’ seat. Would you trust anything that an email sender says if their subject looks something like GET 50% OFF ON EVERY SECOND PURCHASE!!!!!!!!!!!!!!!!!!! You wouldn’t right? Then why would you expect your customers to do anything other than ignoring your email, deleting it, or even marking it as spam? Excessive punctuation and capitalization will bring down the chances of a customer to even open your email let alone giving you their feedback. Research tells us that 44 percent of online shoppers consider the live chat on an ecommerce website to be its best feature. Through it, they can receive help for many issues. If someone is unable to find the products they are looking for, a customer support employee can help them locate those items via chat. Any questions that customers might have about availability, shipping, or payment can also be answered via chat support. Conversions have been shown to increase by 20 percent or more due to live chat. The ROI rates for sales teams shoot up to 300 percent, as well! While live chat solves customers’ issues, it also helps businesses identify patterns. When customer support identifies recurring issues, they begin to see an emerging pattern. This indicates that there is a persisting issue that needs solving. You can use an online service like the Zopim to introduce live chats on your website. Once you have the customer feedback, your response will decide the quality of results you get out of it. If the customer questions are not being addressed promptly, you won’t see much good coming out of the live chat. A proactive approach might be what you need. Increase the efficiency of the live chat by setting the window to appear after a customer has spent 20 seconds on a page. Remember that there are multiple review websites that your customers may use. So, provide them with different options to increase the likelihood of getting reviewed. Moreover, each such site has its own tips that can encourage the influx of positive reviews. Go here to view the site-specific tactics for most popular social media giants! 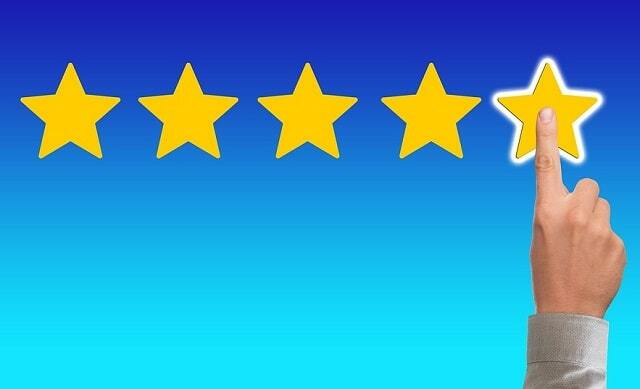 I hope you enjoyed this blog post about 5 ideas to increase the rate of positive reviews and company ratings for your business. Interested in more articles about improving business reviews?